Content Exclusion Beta? Sounds interesting! 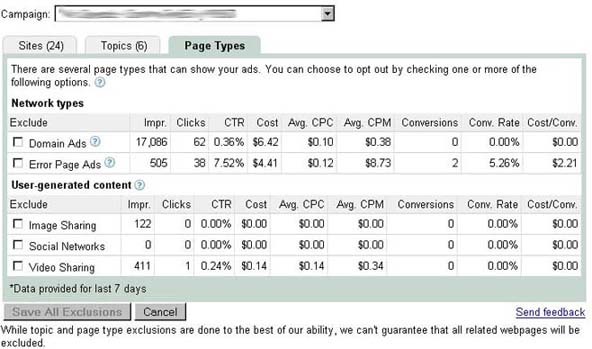 I am a huge fan of the AdWords content network. The ROI from content network campaigns can be many times that of the search network if done right and is a fantastic way to source private advertising deals. I asked one particularly generous client if we could test the new tool and she graciously agreed. This client has allowed us to test every single new tool that Google has released for advertisers with complete free reign, so I was very grateful. The initial screen allows us to select which campaign we would like to work with. Fortunately, we separate all our content network and search network campaigns. After about ten seconds analyzing the campaign, the content exclusion tool came back and offered us three tabs. The first tab, the site exclusion tab offered us a list of sites to pick from and exclude. What is interesting here is that only 24 sites were offered for exclusion and no data was provided as to why these particular sites were presented. As I am the account manager for this particular account, I can tell you now that the sites listed here are all poor performers. What is even more interesting is that all but three of these sites were already excluded using the site exclusion tool. Some feedback was promptly sent to Google regarding this. For those who do not regularly run placement performance reports, this would appear to be a wonderful time saver. Next up was the topics exclusion tab. Now it’s starting to get really interesting. When running a large campaign, it is almost impossible to go through every page and domain listed in large placement performance reports and visit each site to check the content. In fact, the only time we actually visit the site is when there is a large enough sample size with at lease some medium-poor conversion data. I have no idea how Google groups adsense advertisers accurately into topics considering you can use adsense on multiple sites once your initial site has been approved. The final tab is the page types tab. This is probably the most interesting and from reading the AdWords feature request forum threads on webmasterworld, one of the most requesed features. 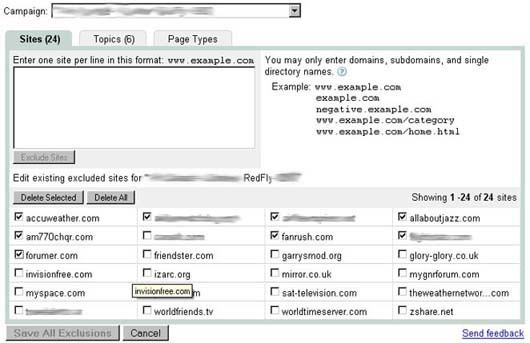 This tab lets you exclude a variety of “types” of pages your content network ads will appear on. The most notable here are domain ads and error page ads. Many advertisers have been crying out to exclude these types of pages from their content network campaigns and their prayers are finally being answered. The other types of exclusion are of the social networking and media sharing sites. From managing this particular campaign, I can tell you that social networks such as MySpace and video sharing sites such as YouTube, are without a doubt, the worst performers. Domain Ads and Error Page Ads are by far the best performers (See below). My initial impressions of the new Content Exclusion Beta tool are pretty good. It is great to see Google taking feedback (Thanks AdWordsAdvisor!) 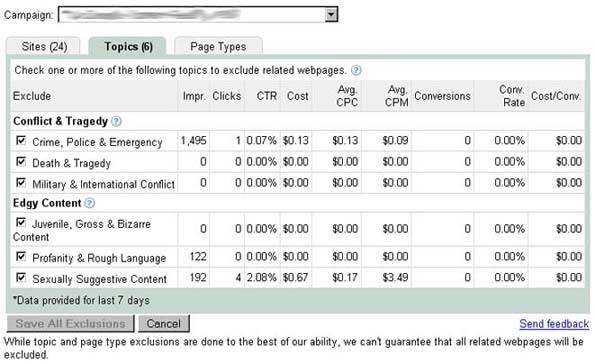 from real AdWords users and implementing the requested features. While this tool is a very handy “overview” tool it is absolutely no substitute for running regular placement performance reports, using statistically valid sample sizes and making good decisions based on that data weather or not to exclude a site from your content network campaigns. I think this new visibility will allow more advertisers make better content network choices and force publishers to create better content to entice advertisers. It is still a little early to tell, but I think this tool will produce some decent results. I’ll keep you posted with the results we get over the coming weeks. I couldn’t agree more. All in all, I applaud Google for the new tool and their steps to improving advertisers control and experience. Way to go Google! Thanks for the comment anonymous. You are right, it is. A little more data and some increased optional exclusion. It’s a step forward in my opinion. Thanks for posting the screenshots. Looks like Google is getting more serious about making contextual advertising work. What I find odd, though, is their selective transparency. Don’t you think it’s odd that they don’t report the actual domains? Here’s what doesn’t make sense to me – AdSense for Domains ads are distributed on *both* the search and content networks. With this new tool, you can block them on the content network. But, what about the search network? I’ve posted some examples of domain ads that are classified as search ads when they’re really contextual ads. No way to block these kinds of ads. Those are the kinds of ads I’d want to block. BTW, great points about thinking before blocking. I bet many parked domains convert better than most content sites. Still, a company whose mission is to organize the world’s information should actually provide a bit more information for its advertisers. Regarding the site list, in my case, the 75 sites that get the most impressions over the last month are included. Also a bit concerned with the Topic-related tab. According to that, two of my clicks were from “Sexually Suggestive Content” sites. But I looked through the list, and can’t see them (it’s a finance campaign, for the record). Dave, don’t the screenshots suggest who your client might be? I mean, how many other advertisers had ads on exactly those domains? Is there a way to exclude pdiddy.com but keep receiving traffic from sportinggoods.com? Mark, unfortunately not. I think that will be the next step though. Well, you can try site exclusion, no? If you’re not sure that one site or another is the poorly converting one, try banning one for a bit and see if the conversion rate improves. Not sure that answered the question, but I hope that helps! I called my google rep the other day and she had no idea when or if this will be rolled out to all Adwords advertisers. Certainly a step in the right direction though. Thanks for stopping by Hans. I edited your comment down due to the spammy nature of the way you were promoting your product on this AND other blogs I read. Next time, please leave your URL in the field provided and keep promotion ON TOPIC. Thanks. Yes, I agree with the majority here, this is definitely a step in the right direction for Adwords and for Google in general. Hi Grant, yes I agree. I just wish YSM would do the same!